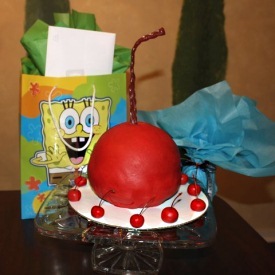 This creative and fun cake was graciously shared by a mom whose son loves cherries. What an absolutely cute surprise this cake would be! To make this cake, use a white cake mix and fluffy white frosting. The Ball cake pan from Wilton, was used to make the round shape. This pan comes in two halves making this a great pan for making soccer balls, and other round cake ideas. Cut and dig out a little bowl shape in the middle of the cake halves, frosted one half with fluffy white and filled one with drained, patted-dry maraschino cherries. Put the top half on and lightly frosted the outside with fluffy white frosting. Then the Red Fondant over the entire ball and tucked underneath it. A cake tester was skewered through a cherry Twizzler and inserted on the top. The remaining fondant was used to make mini cherries (using the leftover real cherry stems) Candles will be placed in the mini cherries.